A measles outbreak that was linked to Disneyland and affected almost 150 people in the United States has been declared over by health officials in California. The California Department of Public Health stated Friday that there have been no reports of new infections for 42 days – or two 21-day incubation periods – meaning that the outbreak is now over in the US. Since December 2014, when the outbreak was first reported, 147 people were diagnosed with the disease, which can be especially problematic for children. In California alone, 131 people were infected, but there were cases reported in several other states, as well as Mexico and Canada. 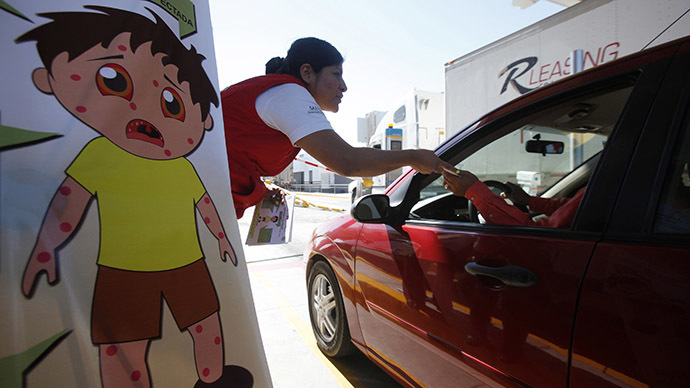 However, the measles outbreak in Quebec, Canada is still ongoing, the Associated Press reported. There, 159 people fell ill after someone visited Disneyland. According to the AP, the community is a “tight-knit religious” one with low rates of vaccination. The source of the Disneyland outbreak has not been verified, but officials believe it’s likely that someone was exposed to the virus overseas before visiting the park. According to the Centers of Disease Control and Prevention, measles is a very contagious respiratory disease caused by a virus that can be dangerous for children. Symptoms typically entail runny nose, fever, cough and sore throat, though it is then followed by a rash that can spread throughout the body. Roughly 25 percent of those who get measles are hospitalized, CDC data shows. The illness can also potentially cause swelling in the brain and result in brain damage. California officials said that measles can be prevented with two doses of the MMR vaccine, which is more than 97 percent effective. The Disneyland outbreak sparked a nationwide debate over vaccines, since some Americans have chosen not to vaccinate their children due to personal or religious reasons. Of the California cases in which vaccination status was confirmed, 70 percent of those infected were not vaccinated. California lawmakers are currently debating a bill that would ban parents from keeping their kids unvaccinated. A vote is expected to take place next week, according to the AP.